Trixie walked in to the kitchen yesterday morning carrying a ladybug that she had crushed in her fingers. It took me a moment to realize what it was. Then I had to repress my gagging while I gingerly gathered it into a paper towel and held it at arms length (even though it was dead) while I walked to the trashcan. I don't do well with the creepy-crawlies. I also don't do well with little furry critters, which is what I found behind the refrigerator later that morning. This one, although squarely caught in the mouse trap, was still alive. Trixie and I retreated to another part of the house. My approach to the mousetraps in our house is to not approach them. But this was either a defective mousetrap or the Superman of mice (Mighty Mouse? ), because after a few hours he (she?) was still going strong behind the refrigerator. I knew we couldn't stay out of the kitchen all day. I also knew that Alex wouldn't be home until dinnertime. So I did the adult thing and asked my dad to come over to, ahem, dispatch of him (her?). One of the many benefits of living very near my dad's place of work. Thanks Dad! So, spring is here! And it's bringing out all of God's creatures, great, small, and very small alike. We are even getting out a bit. Sidewalk chalk, trips to the park. It's still pretty brown and ugly outside, so we headed over to our local conservatory to enjoy some greenery and blooms. I also finished the sweater that I have been working on since October. I usually knit pretty haphazardly, my motto being "close enough." But this was special yarn, (Malabrigo) and I wanted it to turn out great. I was very careful as I worked, trying the sweater on many times throughout the process. And it paid off! I love it, it fits great, and I'm going to wear it as much as I can before it gets too warm. The pattern is Caramel by Isabell Kraemer. linking up with Kelly for some quick takes. It's always hard to say goodbye to summer, but it seems especially hard this year. Summer was this beautiful oasis of rest and family time and no obligations. And now it's almost over. Alex starts school on Monday, and the following week Johnny starts school and I start teaching piano lessons again. Here's a little summer wrap-up before we dig back into schedules and homework and deadlines. We redid our front porch! We have a three season porch on the front of our house that we like to hang out on, even though it sort of looks like it's about to fall off the house. But we had hardly used it this spring or summer because the carpet that was out there (for who knows how many years) was so dirty it would turn the bottoms of our feet black. I didn't like the idea of Trixie crawling around on it. We decided to rip out the carpet and just paint the wooden porch floor. But since we had the carpet out, we decided we might as well go ahead and paint the walls and trim as well. I forgot to take Before Pictures until after we had started. So they're not truly before. This was the first house project we'd done since Trixie was born, and it gave me a new respect and admiration for people who remodel/renovate their homes while living in them, with kids. It took us almost a week of late night painting after the kids had fallen asleep. One week and one Ikea trip later we had a new front porch that we absolutely love spending time on. But we were exhausted and I vowed no more house projects for the summer. We decided to replace our bathtub! The bathtub that was in the house when we bought it almost 7 years ago was a whirlpool, but we never used the the jets because they leak water into our kitchen. Over the years we've been sort of worried that the unused jets were just harboring all sorts of mold and bacteria, so this summer we decided we couldn't bathe our children in there one more time and we had to put a new tub in. The online tutorial said you would need one day and two people to get this done. I'll spare you all the gory details, but one WEEK later, we had our bathroom back to normal. Once again, I have no idea how you DIY-fixer-upper people do it. House projects make me really crabby. But I do love the end result. During: I cannot handle chaos!!! Mad props to Alex for getting this done without having to bring in a professional. (Besides my carpenter brother.) Now that's it's over I'm really glad we did it. But, #neveragain. In knitting news. I made this sweater! And also played around with some sewing and crocheting. Now I am turning my attention to Handmade Christmas. I'd like to make everyone in my family something, even if it's just a little thing. But I have to start now! We lost control of the garden. I weeded once in July. But somehow we're still managing to get quite a lot of vegetables! Here's a list I made a couple years ago of things I like to do with my tomatoes. Alex and I finally finished Downton Abbey! We had given up on it after Season 3. Too many people had been killed off, and the story felt too contrived. We didn't feel like we were missing out on much, but then I kept hearing from people how great the final season was. So we gave it another chance. Parts of season 4 were sort of painful, but once we got to season 5 I was thoroughly enjoying myself. And I cried my way through season 6. We had a very brief stint of potty training. Johnny doesn't have to be potty trained for his wonderful deaf and hard-of-hearing preschool; they don't want any barriers between DHH kids getting the aural training they need. But I thought it might be nice to have him potty trained for this fall anyway. Day 1 went ok. Day 2 was a nightmare which left me in tears and consulting all my mama Facebook groups. And this, my friends, is why it takes a village. I got so much encouragement and helpful advice. I felt released from trying to get him potty trained right now, and I didn't feel like a failure because of my decision to quit. We are going to wait a few more months and see if Johnny takes any initiative. Thank you everyone who advised me! Calling all bloggers! My friend Jacqui and I are planning a Midwest-region Catholic Women Bloggers Conference for March of 2017 here in St. Paul. We're still in the early stages of planning but I can guarantee you it's going to be so much fun!! If you blog and you want to stay in the loop about this you should join our Facebook group. We want to see you all there! Alex has been on spring break this week. He's been trying to do a good amount of studying every day, but we have gotten to see him more than usual which is nice. It's especially nice to have him here in the morning. We sleep in as late as the babies will allow, and then take our time getting breakfast ready, and eat all together. It makes such a difference having an extra pair of hands around in the morning. Especially if that extra pair of hands gets the coffee ready right away! Last weekend I threw a bridal shower for my little sister. It was super fun. I love everything about planning parties, sending out invites, menu planning, food prep, decorating, entertainment, it all thrills me. I think in my next life I will be Martha Stewart. One thing I have always wanted to do for a party is make a photo booth wall. It maybe makes more sense to have a photo booth wall at a wedding, or a New Years party, but I wanted to make one and this shower was my excuse. Here's Johnny demonstrating how to use the wall. Here's my sister and me. I can't believe my little sister in getting married in one month!! Here's my sister and her fiance. They're so hip. Is it tacky to just leave all the decorations up for the bachelorette party I will be hosting in 4 weeks? I hope not because that's what I'm going to do. Johnny loves eating his meals under a canopy of streamers. We have a Whole Foods a few blocks from our house that is moving to a new location a few blocks in a different direction from our house. Tuesday was their last day at the old location and they were having a moving sale - the whole store was 50% off! Now we are not Whole Foods people by any means. We are Aldi people, with a splash of Trader Joe's and a hint of Target. We only shop at Whole Food if we need something very obscure, like sorghum flour, or if we need milk immediately and don't want to drive to Target. But we decided to go check out the moving sale, hoping to snag some cheap Naked Juice or essential oils. Well, I think everyone in St. Paul was there. It was wall to wall madness, we got there about 3 minutes after they opened and the essential oils were completely picked over. We did get some Naked Juice though. I also grabbed one of their bakery cakes. We put it in the freezer are we're going to have it on Easter. We got a few of their bulk cookies for Johnny and he stood in the ridiculously long and glacially slow line so patiently just holding onto his little bag of cookies. I wish I had gotten a picture of him. It took so long in the line that I had to leave with the kids to take Johnny to speech therapy. Alex stuck it out in line for another hour before getting out of there with our groceries. Was it worth it? I guess we'll find out on Easter when we eat that cake. I finished another sweater! This time for my sister. The pattern was very easy, but very boring, as you are just knitting a giant square of stockinette, and then sewing it together to create the sleeves. I started it before Christmas and it's taken me this long to finish because it was so boring and I kept starting new things. But now it's done and I'm really happy with how it turned out! In case you are interested I have a Pinterest board of patterns I like. I've made many of them. But most are things I hope to make some day. Related to knitting: I have been listening to a lot of podcasts lately. They are especially great to have on while knitting, even better than a movie because there is absolutely no visual to keep up with. My friend Jacqui recommend the podcast Stuff You Missed In History Class and it has quickly become my favorite. That and Fountains of Carrots. This week Stuff You Missed In History Class did an episode about the history of knitting. And I listened to it last night....WHILE I was knitting. I know it will make me seem like a huge nerd when I say this, but I so excited about it! It was the perfect evening. I was over at Blessed Is She this past Monday. Check it out if you didn't see it. So starts the well-loved Psalm that I have had memorized since I was about six years old. Beside restful waters He leads me. Even though I walk through the dark valley I will fear no evil; for you are at my side. Dark valley? Evil? These are not things I want to deal with......read the rest here! So, Johnny is really in to trains right now. All things trains, train puzzles, train books, we live near a train line and often see the train while running errands, and he always exclaims "TAAAAIN" from the back seat. It's very cute. His favorite of course is to build the wooded train tracks. We got him a started kit a while back and since then have been given a ton of hand-me-down trains from some family and friends. We're putting this little beauty in his Easter basket. I am not always very good at playing with kids' toys, but I do enjoy building trains with him. I am grateful that he is into something that we can do together. I'm actually getting quite good at building cool train tracks. I've been taking pictures of some of my best ones, which I will now share with you. 7 quick takes vol. 22 plus Lenten Giveaway! We survived the black hole of the 4th trimester just in time to jump into the black hole of January. Alex is back in class, it's been absolutely arctic around here (on a few days, technically sub-arctic), and Johnny gets a little stir crazy from all the staying indoors. But at least Trixie has transformed from a fussy newborn who needs to be bounced constantly to a very happy infant who takes 3 hour naps. Yay Trixie! I didn't make any resolutions at the start of the New Year. But the weekend before Alex started class again, when my anxiety was mounting and a knot of dread was growing larger and larger in my stomach, I decided I needed a resolution for the semester, and it is this: to work on my attitude. When the days are long and lonely, and the job of mom never ends, it's easy for me to get into negative mindsets, and to feel sorry for myself. Yes, things are crazy-hard sometimes. I can't control how long the kids will nap, I can't control Johnny's toddler tantrums, I can't control Alex's study load and how much time he will get to spend with us, but I can control my own attitude and how I react to all those things. If I can keep a good attitude it makes everything go so much more smoothly. So that's what I'm going to do. That's what I'm going to try to do. I had some pretty big plans for knitting projects over Christmas break, and I only completed one of them. But it was an adult-sized sweater, so that's pretty good I guess. I made this sweater for my mom! She picked out the yarn and the pattern and I knitted it up to say thanks for all the babysitting she does for my while I teach piano lessons. I think it turned out pretty nice! P.S. those photos were taken on a day when Johnny styled his hair with Vaseline. Thus the crazy. Another thing that happened over Christmas break, which I totally did not see coming, was that I got really into The Walking Dead! Who, me? Yeah! Totally weird. Alex has been watching that show for the last few years. I thought it would be way too scary for me, so it's always been the show that he watches when I'm not around. He was catching up on the most recent season over his break, and every now and then I would come in during the last few minutes of an episode. I ended up being drawn into the story and the characters, so I watched the last two episodes of season 5 with him. And when they were over, I wanted to go back and watch from the beginning. So I did! It is scary, and it is pretty gory. It's a zombie show after all. But it's not really about zombies, it's about the people who are surviving in spite of the zombies, and in spite of other people. It's about family, loyalty, moral dilemmas, and ethics in light of a zombie apocalypse. But if you have a squeamish stomach, you may want to avoid. Also, I think the only reason I could handle it was because I had seen some of season 5, so I knew which characters survived. That made it much less scary. I read somewhere that season 6 starts up on February 14th. I know what what Alex and I will doing on Valentines Day! I had three new recipes in my meal plan this past week. This soup, this soup, and these amazing sliders. And they were all winners! If you're in a recipe rut, I say check these out. Last weekend I did my first solo mass with 2 kids. Alex used to be a regular cantor at our parish, but he hasn't done any singing since he started PA school. Last Saturday the cantor for the 5:00 pm mass had a family emergency to attend to and they were in real bind. So I told Alex I was up for trying it alone with the kiddos if he wanted to sing. And it went...not terribly. Trixie slept in her car seat for the first half and Johnny was very interested in watching Alex up on the altar. Then Trixie woke up and wanted to nurse, and Johnny began to realize he could get away with a lot more. Afterwards I had a few people tell me that I was very brave and that my kids did really well, which was so encouraging, especially when you feel like you're in survival mode during mass. Did you realize that Lent is less than a month away? Crazy, but true. It's time to get ready now. 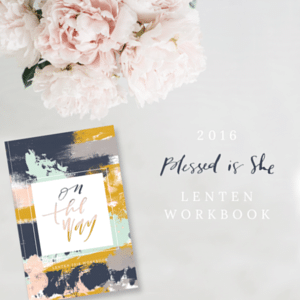 Especially if you want to get a hold of one of beautiful Lenten Devotional Workbooks found in the Blessed is She Shop. They are going like hot cakes so if you want one you'd better hurry! I'm also giving one away here! I wish I could get one for all of you, but this will have to suffice. Good luck entering! for more quick takes visit This Ain't the Lyceum. disclosure: some links may be affiliate.